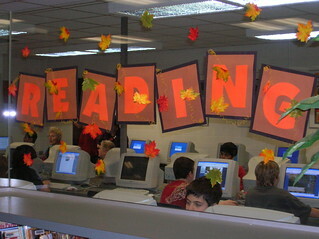 CLOSE UP: This autumn display was placed on a glass partition between our school library and one of our computer labs. 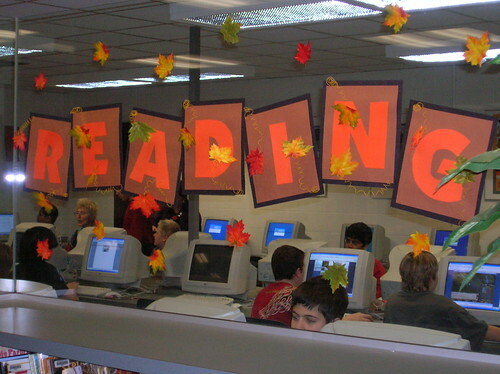 It was made from letters printed on construction paper using a wordprocessing program, and hand-cut. Silk leaves were glued to very thin loosely-coiled wire (wrapped wire around a pencil to make coils) and attached behind the letters. The leaves bounced up and down and swayed whenever someone walked by. The kids loved it! Lettering was printed using Microsoft Word, and hand cut.